Waste analysis | Diram s.r.o. 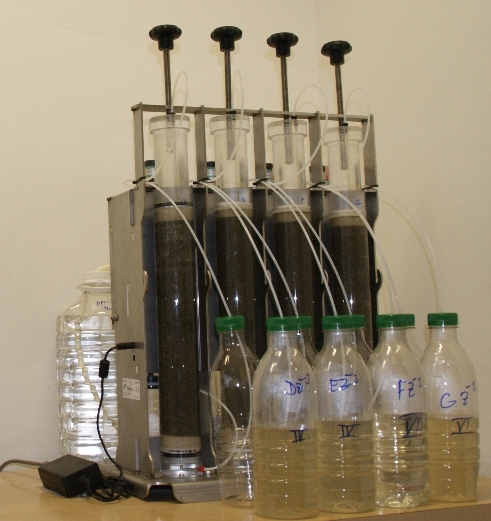 The Diper 4K instrument has been developed, by Diram s.r.o., to perform routine semi-automatic column leaching tests to determine the leaching behaviour of granular waste materials under standardized percolation conditions. It enables to follow routines according to the norm CEN/TS 14405 Characterization of waste – Leaching behaviour tests – Up-flow percolation test (under specified conditions). Diper4K instrument enables to perform four independent simultaneous tests. The purpose of the testing is to determine the release of constituents from waste. In the typical test the test portion of the waste is packed in a percolation column in a standardized manner. The leachant – demineralized water is percolated in up-flow through the column at a specified flow rate up to a fixed L/S ratio. The eluate is collected in several separate fractions that are consequently characterized physically and chemically. Diper 4K instrument is composed of four test sets that enable to perform four independent percolation tests. Schematic representation of the test set of Diper 4K is shown in Fig.2. Water from the reservoir is drawn into the piston and then pulled into the percolation column at adjustable rate. The direction of the water flow is given by the inlet three-port valve and by the piston movement direction. Water flows through the column in the up-flow manner and the leachant fractions are collected in the outlet. The automatic three way vents at the outlet of each column allow for separation of two consecutive fractions. The instrument is fully controlled by PC. It enables either “manual” control of individual piston movements or it automatically performs a complete leaching test according to the predefined routine.